Few musicians have managed to navigate the richly varied avenues of New York City’s abundant music scene with the same passion and adaptability as trombonist and composer Ryan Keberle. Since his arrival in 1999, Keberle’s diverse talents have earned him a place alongside a staggering array of legends, superstars, and up-and-coming innovators. Catharsis, which features rising-star Camila Meza on voice and guitar, saxophone legend, Scott Robinson, Jorge Roeder on bass and Eric Doob on drums brings together elements of chamber music, South American folk, indie rock, and jazz to form a unique sound of “indie jazz” that has thrilled audiences around the world for the past 8 years. Catharsis has toured extensively on the international stage engaging audiences at the Toronto, Ottawa, Rochester and Bergamo International Jazz Festivals, and at premier jazz clubs including Pizza Express (London), Duc des Lombards (Paris), Stadtgarten (Cologne), Jazz Standard and Jazz at Lincoln Center (New York) and Blue Whale (Los Angeles), among many others. The band was also featured in NPR’s prestigious Tiny Desk Concert series and on the French TV channel Mezzo. 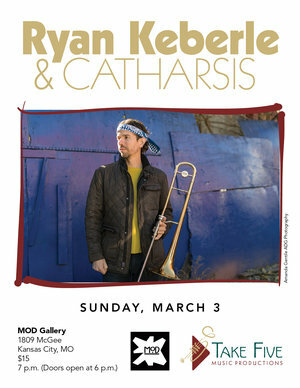 Catharsis band members bring an impressive wealth of experience of their own, playing an integral role in many of today’s foremost rock, jazz and Latin jazz ensembles, including bands led by ‪Sufjan Stevens, Maria Schneider, Miguel Zenon, ‪Gary Burton, ‪Julian Lage, Paquito D’Rivera and Tom Harrell. Part of the Take Five Music Productions Series at MOD Gallery. All seats GA. Doors at 6pm, show at 7pm. $15.